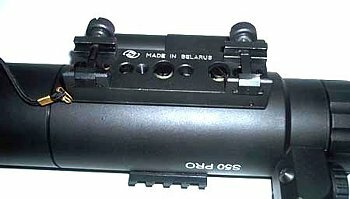 S50 is a compact night vision weapon sight of 1st generation with the built-in infra-red illuminator and projection aiming mark of red colour. The weapon sight is intended for orientation on terrain and management of aiming fire from the hunting weapon in conditions of low intensity of illumination at temperature of air from -20 up to +40 oC. Undoubtedly advantage of the rifle scope is the absence of plastic parts in a design. At manufacturing each sight is tested on impact loads on a special bench - 50 shocks 250 g. In opposite to many other producers, we measure spacing interval up to an exit pupil of the night scope directly from edges of the eyepiece (instead of from a lenticle). Therefore we guarantee absolutely safe distance of a sight against eyes at fire. In a sight S50 this spacing interval not less than 50 mm! The sight is made up with a protective cover of a lens, which one allows to shoot at light time of day. The sight is sold together with a safe bag, which one can be dressed on a night sight without removal from weapon. The sight S50 is made up with a slideway for the installation on your weapon. - NEW S50 sight 1 pcs. - Operation manual 1 pcs. Rifles with standard 7/8" Weaver mount.